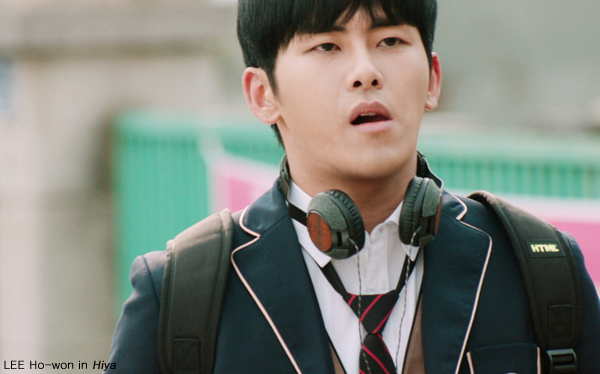 Hoya of a boy band INFINITE makes a film debut with Hiya, to be released in March, by his real name LEE Ho-won. LEE is a popular member of INFINITE, a Korean boy band which began its music career in 2010, where he takes part as a vocalist, rapper and dancer. He debuted as an actor with a special appearance in TV dramas like Reply, 1997 (2012) and Reply, 1994 (2013), and continued acting in significant supporting roles in TV dramas including My Lovely Girl (2014) and Mask (2015). Hiya is his first film. Hiya depicts brotherhood between Jin-sang (AHN Bo-hyun), an elder brother and a troublemaker at school as well as at home, and Jin-ho (LEE Ho-won), his younger brother, a would-be singer who rejects his brother. In the film, LEE is to show a sensitive emotion of a teenager whose sentiments towards his elder brother are mixed with love and hate, since he gets in trouble because of his brother in an alleged murder case. 'Hiya' means an elder brother in the Gyeongsang-do Province dialect. Hiya is KIM Ji-yeon’s directing debut as well. A former model and a film rookie AHN takes the lead with LEE, and PARK Cheol-min and JUNG Kyung-ho are appearing in supporting roles with their distinguished acting. The film is produced by Major Town Inc, and distributed by Like Contents Inc.